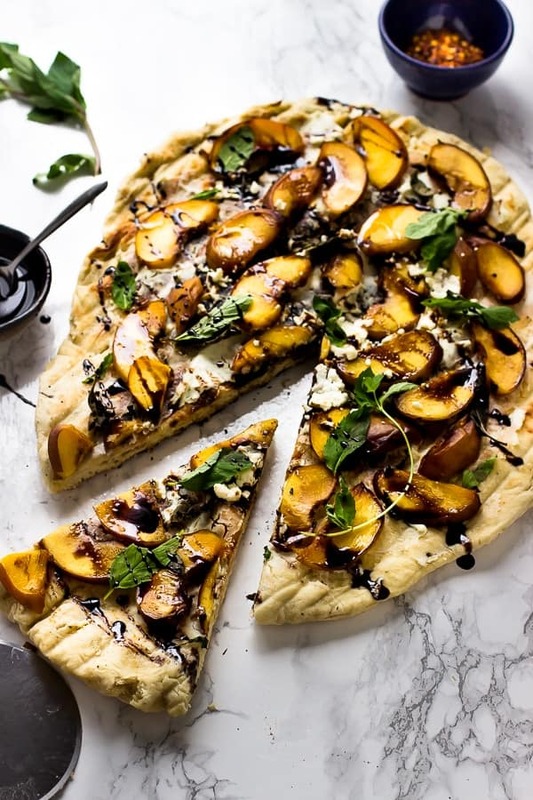 This Grilled Peach, Basil and Goat Cheese Pizza is a winner! Topped with soft grilled peaches, creamy goat cheese and a delicious tangy balsamic drizzle. It’s the perfect grilled summer pizza! Homemade pizza is one of those things that I believe everyone needs to experience once (or ten times, who’s counting?) in their lives because it will always, always taste better when you’ve made it at home. Kale Pesto Pizza anyone?! You get to choose the exact amount of thickness or thinness in the crust. Endless amount of toppings without an additional fee (psh). Also, more cheese than the pizza company would probably find acceptable. I love that you can change pizza to fit your mood and season. 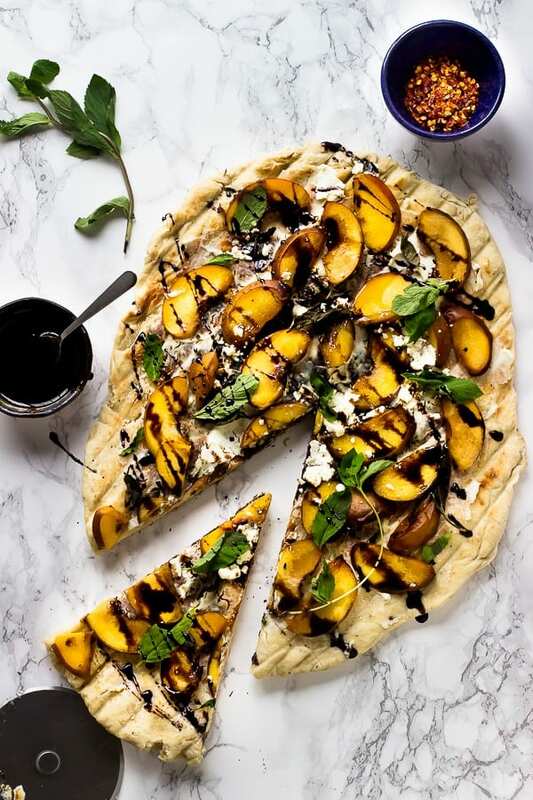 This grilled peach, basil and goat cheese pizza is the perfect for the summer season. P.S. the pizza story I’m about to share with you is hilariously embarrassing. Yet, it would be criminal of me not to share! There’s a pretty funny story behind the making of this pizza. OH, it involves a storm forming the moment I placed the pizza on the grill. This was the very first time I had lit our grill by myself as the Mr. is the known grill master in the family. Being the over-adventurous individual, I am and armed with over-the-phone-“easy-enough” instructions, I proceeded to set up the coal and light the grill. Easy enough right? About three seconds after I placed the pizza dough on the hot grill, torrential rains began to fall. I’m not exaggerating. Like, the skies opened up. Thanks to the wind that decided to join the party, the rain was blowing inwards. Fortunately I was under the back patio cover, and turning the grill towards the living room to prevent the rain from completely soaking my dough. This now meant that all my toppings perfectly set up mise en place were about to get drenched, so cue me running back and forth to ensure everything was protected from the rain. If you’re laughing, that’s fine because I’m laughing too! Also cue me burning the entire crust because of well ya know, spending the time securing my pizza ingredients from this mini hurricane. Pro tip: don’t burn the crust, okay? One more entire pizza crust later and rains subsiding, I was proud to produce this beauty. 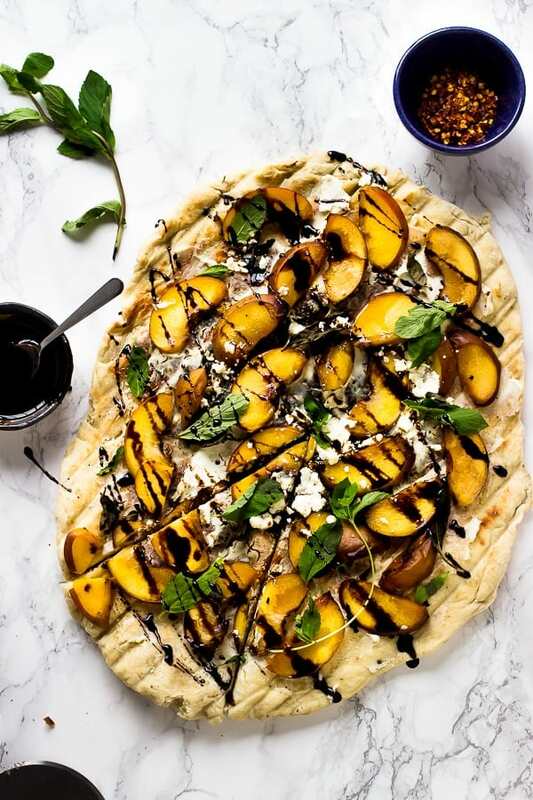 This grilled peach, basil and goat cheese pizza is a true gem. Fruit pizzas are seriously underrated. The grilled peaches give a very meaty texture to the pizza with their subtle peach flavour enhanced from the grilling. The goat cheese adds a delicate tanginess and a divine creaminess to the base of the pizza. The basil is just absolutely delicious and next time I would definitely turn it into a pesto using this pesto recipe and spread it with the goat cheese. Then there’s the balsamic reduction, drizzle, glaze…anything your heart desires to call it. It’s the perfect bite and “cherry on top” for this pizza. You can feel free to add as much or as little as you like. I would keep some around when you’re eating it because you’ll probably find that you can’t get enough of it. Here’s to me sharing way more pizza recipes with you all, and to you completely devouring this one in the meantime. In a pot over medium high heat, heat all the ingredients and stir. Watch carefully - the glaze should begin to thicken after 5 minutes and you want it thick enough to stick to the back of a spoon, but not to thicken into a glob. It becomes very thick very quickly so watch carefully. Once glaze has thickened, remove from heat. Heat up your grill to high heat. If you have a coal grill, set it so that your pizza is over the direct heat. I make that in the centre of the grill. You can grill your peaches from beforehand, or right before. Have all your toppings on a table beside the grill for when you're ready to use them. Flour a clean working surface lightly and roll out or stretch the pizza dough with your hands to about a 12-inch circle (or as thick or thin as you desire, just ensure it is even throughout). Don't do a rimmed crust since it will give difficulties while cooking on the grill. Brush one side of the dough with olive oil. When the grill is heated, place the olive oil brushed side down onto the grill. Cook for about 2-4 minutes until grill marks appear and dough begins to cook. Your dough may begin to get air pockets on the top side of the pizza. Check after it's been on for 2 minutes to ensure the crust doesn't burn. When you're ready to flip the dough, ensure all your ingredients are ready. Flip the dough and begin arrange the ingredients quickly on the pizza. Close the grill and allow to cook through for about 3 to 5 minutes, checking periodically for doneness and to ensure the crust doesn't burn. If it begins to burn, move to an indirect part of the grill so that it can continue to cook. Check to ensure the dough is completely cooked and remove and slice accordingly. Drizzle with balsamic reduction. Allow to cool slightly, then slice and enjoy! 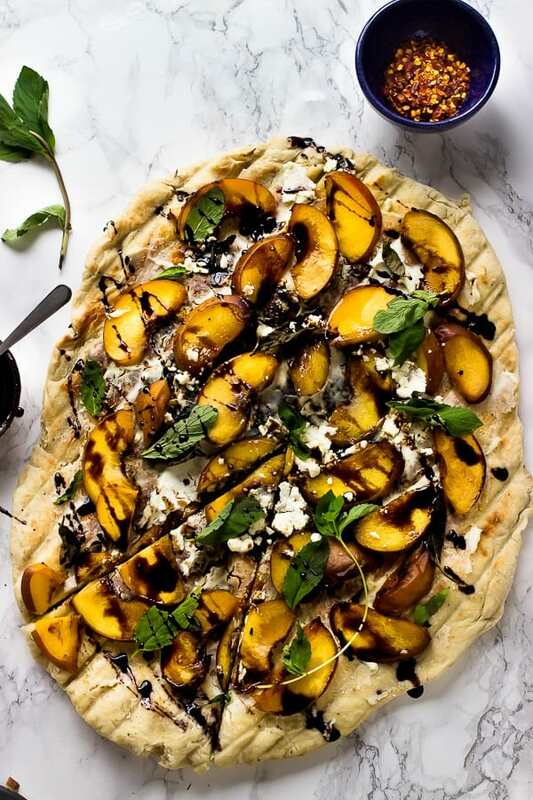 If you try this Grilled Peach, Basil and Goat Cheese Pizza please let me know in the comment section below, or tag me on instagram with the hashtag #jessicainthekitchen! For more exclusive recipes follow me on Instagram AND on Snapchat: jessinkitchen. This pizza has my name written ALL over it! 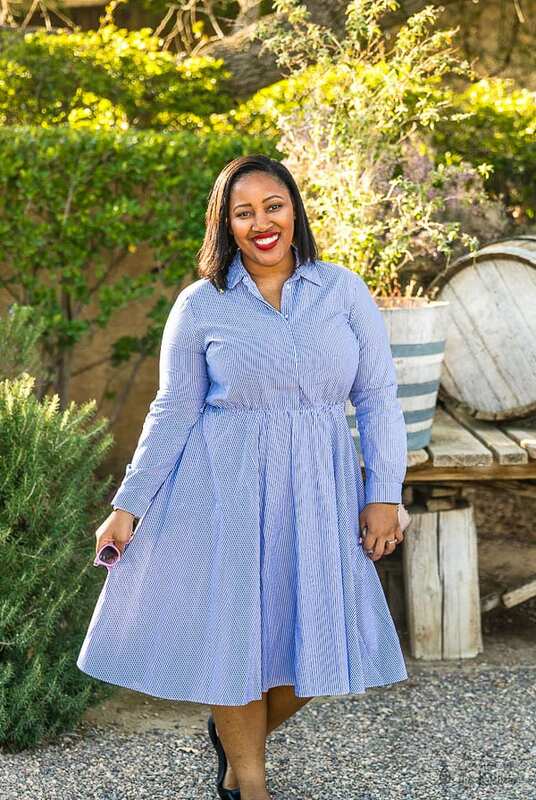 Such a wonderful combination, Jessica! I love the peach and goat cheese on here. 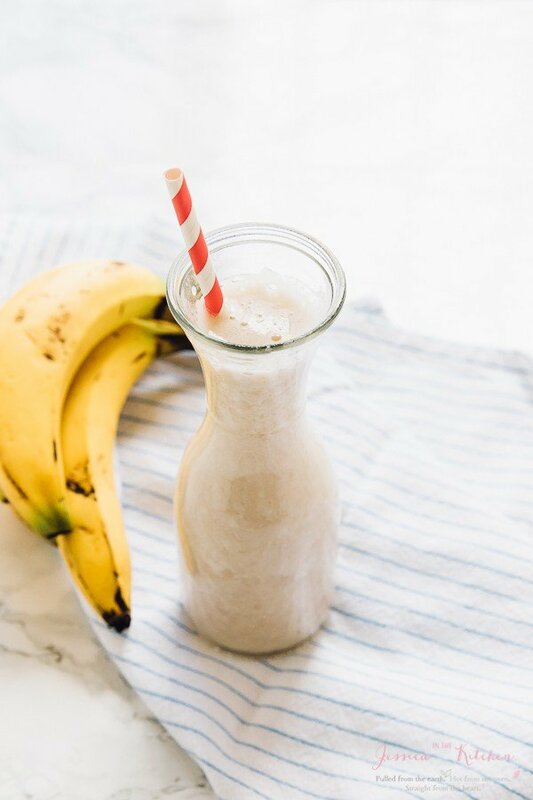 This just screams summer and deliciousness! 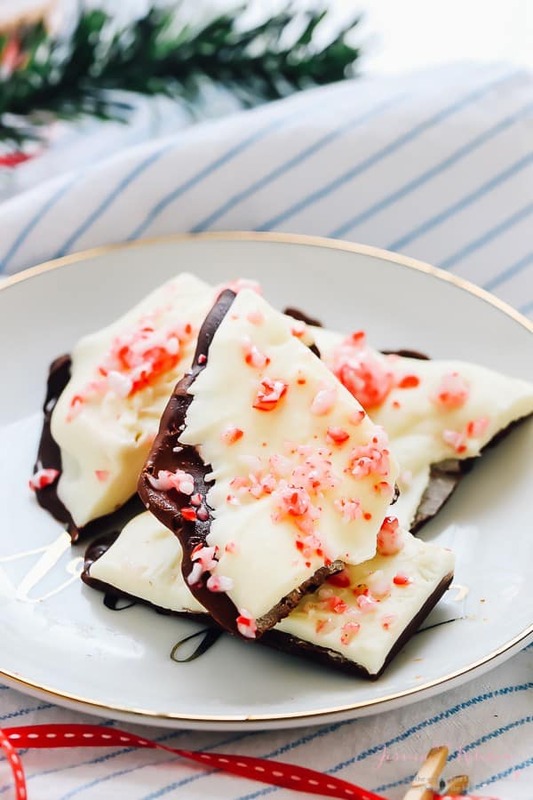 My favorite things all in one recipe! I’m seriously drooling, Jessica? This is happening over the weekend! absolutely love this pizza, what wonderful flavors!